Come for Summer. Stay for Fall. Kiddie Academy’s summer camp program, CampVentures, inspires imagination through exciting activities, various themes, and special visitors, while balancing the individual needs and interests of each child in our care. CampVentures awakens a summer of fun, learning, and friendships for your child. 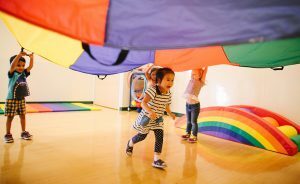 Our year-round programs provide children ages 6 weeks – 5 years old with enriching early learning environments, helping them prepare for kindergarten and beyond. Our year-round programs provide children ages 6 weeks – 5 years old with enriching early learning environments, helping them prepare for kindergarten and beyond. Hours are 6:30 am until 6:30 pm and the learning happens all day. Find Out More at Our Open Houses. Stop by our Open House at one of our five academies on Wednesday, April 10 from 4 p.m. – 6:30 p.m. or Saturday, April 13 from 10 a.m. – 1 p.m. Our friendly, amazing director will take you on a journey through our academy, stopping to see the classroom your child would join. You’ll learn about the curriculum, make a stop in our commercial-grade kitchen, and hear more about the special moments in a Kiddie Academy day. Enroll by June 30, 2019 and Get One Week Free! Kiddie Academy of Oakbrook Terrace and Kiddie Academy of Lincoln Square are under construction and scheduled to open soon. We are conducting tours for these new locations at our other five Chicagoloand academies. Contact us to learn more.